In November 1938 Charles Lindbergh wrote urgently to Maj. Gen. Henry Harley “Hap” Arnold, the new chief of the Army Air Corps. Touring Germany, the aviation hero had witnessed the surging Luftwaffe firsthand. Arnold, on the job little more than a month, took Lindy’s warning to heart. He summoned to the National Academy of Sciences a group of researchers and university administrators, including MIT president Vannevar Bush and California Institute of Technology physicists Robert Millikan and Theodore von Kármán. Some military men thought Arnold was wasting time talking to “longhairs.” Invited by his old friend to lunch with the scientists, Gen. George C. Marshall balked. “What on earth are you doing with people like that?” Marshall asked. 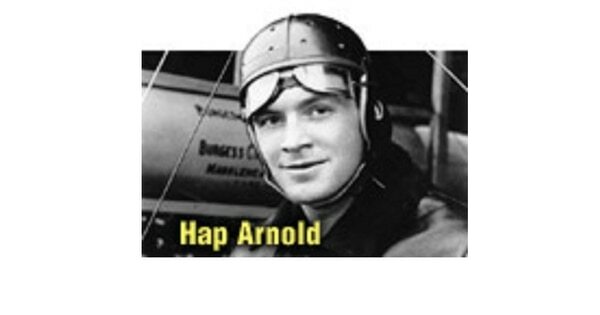 A near-crash over Kansas put Arnold off planes; he knew too many Army aviators who had augered in. He returned to Washington as aide to the chief of the Signal Corps, meeting many future military aviation stars, such as Capt. William D. “Billy” Mitchell, at that point not yet flight-qualified. In September 1913 Arnold married Eleanor “Bee” Pool. The next year, another Philippines posting landed the Arnolds at Fort McKinley, Luzon, where Arnold forged strong bonds with his next-door neighbor, Lt. George Marshall. After a stint in upstate New York, Arnold was ordered to Rockwell Field near San Diego. Pressed by Mitchell, and drawn by an immediate promotion to captain plus a newly instituted pay increase of 50 percent for hazardous duty, Arnold resumed flying. The ambition and stubbornness that enabled Arnold to return to the cockpit could rankle superiors. At Rockwell Field, his commander correctly asserted that Arnold had disobeyed orders when he and others searched for two lost airmen. In fact the commander had dithered, so Arnold had done what he thought best in a crisis. Army authorities reprimanded Arnold’s boss; the next efficiency report he wrote about Arnold might have sunk other men but Arnold’s otherwise stellar record overrode it. After the war, control of the Army Air Service fell to ground-pounders who saw fliers as handmaidens to the infantry and artillery. As Air Service ranks shrank from 190,000 to 27,000, Arnold found common cause with likeminded aviators — Lt. Cols Billy Mitchell and James Doolittle, Maj. Carl Spaatz and Lt. Ira Eaker — all of them arguing for what they saw as America’s military future. Personal and professional setbacks — his toddler son’s death, a plane crash, a bout with ulcers — rocked Arnold, but he pressed on. Another Washington posting inserted him into the debate over which weapon would predominate: aircraft or dreadnought. His pal Mitchell so fiercely criticized Army reluctance to embrace aviation that he was court-martialed, and so almost was Arnold — for touting air power to Congress and the media. Given 24 hours to decide if he wanted to resign or face a tribunal, Arnold stood firm. His critics backed down, but as penalty for his audacity, he was exiled to Fort Riley, Kansas, to teach flying. It was a toss into the brambles, but one that had him training the men who would fly the nation’s warplanes and enabled him to advance aviation as a combat arm. In November 1931, Lt. Col. Arnold took command of the air base at March Field, California. He looked up Bob Millikan, who in 1923 had won the Nobel Prize in physics and now ran nearby California Institute of Technology. The bond begun with the Kettering Bug paid off. Millikan got planes for research; Arnold got access to Caltech’s scientific resources, including wind tunnels and an aerodynamics lab, managed by Theodore von Kármán, a brilliant Hungarian. This came at a time when the Air Corps, as it was now called, was looking to buff its image with flying shows and record-setting flights. Arnold garnered coverage for the service in another way when an earthquake slammed Long Beach in 1933. He organized and dispatched emergency supply convoys with an alacrity that first nettled 9th Corps commander Gen. Malin Craig because Arnold had run roughshod over command protocol. However, once Craig understood the gravity of the situation, he voiced admiration for his energetic subordinate. In 1934, Arnold again made aerial news when he led 10 Martin B-10s, the country’s first all-metal monoplane bombers, from Washington, D.C., to Alaska and back. Later that year, Congress summoned Arnold to testify on the Air Corps. Asked if, given the chance, he could “straighten out” the corps, Arnold said he was sure he could. 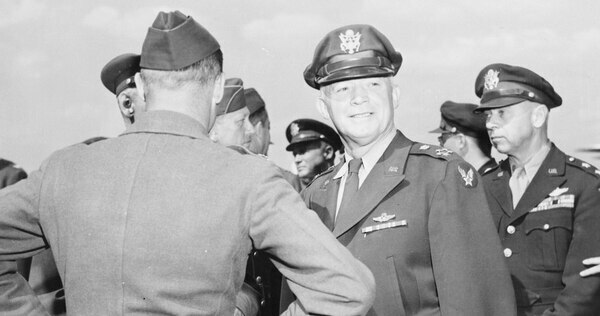 He had hoped the Alaska flight would bump him to brigadier, but that had to wait until Craig became Army chief of staff and Gen. Oscar Westover, a year ahead of Arnold at West Point, took over the Air Corps. In January 1936, Arnold got his promotion and was named Westover’s assistant. Boeing was developing a four-engine successor to the B-10, intended to realize Billy Mitchell’s vision of a global bomber fleet. The Corps saw its future in the B-17 Flying Fortress, which Arnold later called “a turning point in the course of air power.” But even before the first Fortress went into operational testing in March 1937, political opposition and interservice rivalry threatened to ground it. Critics said the B-17 was too new, too big, too experimental, too untested. Why buy heavy long-range bombers? Arnold and Westover fought back, in their 1938 budget requesting 50 more B-17s. Congress cut them. Production picked up in 1941, but not until after the U.S. entered the war did the floodgates open. On Sept. 21, 1938, Westover was flying over Burbank, California, testing a plane when its engine stalled. The crash killed him and his crew chief. Arnold assumed Westover’s duties in an acting capacity. A week later, as British and French officials huddled in Munich, Germany, preparing to give Hitler the Sudetenland, President Roosevelt called in his cabinet and military leaders, including the acting air chief. Only airpower would faze Hitler, Roosevelt declared. He said he wanted planes — now — and many more than the 178 stipulated in the 1940 budget. Of the nation’s 5,000 military aircraft, only half were built for combat. Shocking nearly all present save Arnold, FDR demanded a production goal of 10,000 planes a year, with capacity for 20,000 going all-out. Roosevelt said he felt alarm not only about American airpower, but Allied readiness. He asked Arnold for numbers. Always driven, Arnold drove himself harder. The day Germany invaded Poland, Roosevelt named Arnold’s long-ago Luzon neighbor George Marshall as Army chief of staff. The trust in which the generals held one another lasted to the end of their lives. Arnold saw in the Blitzkrieg confirmation that “our worry about the German Luftwaffe had been well-founded.” The Air Corps had to get the most planes with the greatest capabilities flying as quickly as possible. Scientists and engineers were to improve and perfect the B-17, an even bigger heavy bomber — the B-29, long-range fighters, and other aerial weapons also in the pipeline. The Air Corps got a nominal promotion in 1941 to the Army Air Forces as Arnold continued his 12-hour-plus days, traveling to factories, fields, training facilities, wherever necessary. Lend-lease business put him face to face with the future. On a trip to the United Kingdom, Arnold visited Power Jets, a company at work on a revolutionary power plant that engineer Frank Whittle had conceived in the 1920s. The sight of a plane rolling down a runway with no propellers flabbergasted Arnold — and dismayed him, because the first jet-powered aircraft had come not out of an American workshop. The British agreed to collaborate. Arnold talked with Bell Aircraft and General Electric about Bell building a plane and GE an engine. GE wasn’t ready. No problem: Arnold borrowed a Whittle as a model, and work began on the XP-59 Airacomet, shrouded in secrecy, right down to a dummy propeller for disguise. “My God, General, how do you keep the Empire State Building a secret?” Arnold’s military liaison asked. “You keep it a secret,” Arnold snapped. The XP-59 debuted on Sept. 30, 1942, at Muroc Army Air Field, California, but remained under wraps until January 1944, when newspapers ballyhooed a new “rocket plane.” The jet had no functional range and never saw action, but, with its German cousins, it was to usher in a new era of aviation. Arnold felt that flak and fighters were costing the Allies too many crews over Europe. To win a war, he observed, one must “try and kill as many men and destroy as much property as you can. If you can get mechanical machines to do this, then you are saving lives at the outset.” He leaned on his scientists to improve remote guidance and piloting systems. Angling to make innovation practical, Arnold remembered his World War I project with Charles Kettering, and set the Kettering Bug’s inventor to work on a “glide bomb” — a cheap, unmanned craft that bombers could launch from hundreds of miles away. Controlled by radio and a new technology called television, glide bombs had success, but proved inaccurate and were sidelined. Another Arnold concept, Project Aphrodite, repurposed 24 worn-out B-17s and B-24s as guided and sometimes unguided weapons crammed with explosives and steered toward enemy territory. Pilots bailed out, sending planes on autopilot or remote control toward their destinations. Of more than 20 Aphrodite missions, all but one failed. In the Pacific, Allied conquests were close to putting the new B-29 Superfortress within range of Japan. But as of January 1944, Boeing’s Wichita plant had put only 16 Superfortresses into the air. The bottleneck drew a vexed Arnold to Wichita in March. “I was appalled,” he said. “There were shortages in all kinds and classes of equipment. The engines were not fitted with the latest gadgets; the planes were not ready to go.” Arnold ordered Maj. Gen. Bennett Meyers to Wichita, authorized to act as needed to get B-29s flying. Work stopped on everything else. Technicians and parts streamed from everywhere. Shifts went around the clock. Certain that the big plane needed its own unit, Arnold created the 20th Air Force, with himself as commander and subordinates in the field maintaining operational control. On a windswept fall day in New York, he and Kármán met in an Army staff car parked out on a runway at LaGuardia Field. This war was ending, Arnold said. What about the next one? What would airplanes be like in 10, 20, 30 years? How would radar, jet propulsion, atomic power, guided missiles figure into that? He invited Kármán to the Pentagon to draw a blueprint for air force research. The Cal Tech wizard hesitated, but went on to lead a study group that wrote Toward New Horizons, a report that influenced not only the Air Force but aeronautical science in general. It was typical Arnold: address the practical and immediate without forgetting the big picture. Once he had the present more or less under control, he resumed anticipating new problems and prospects in science and technology. As 1944 was ending, Marshall and Roosevelt, who had awarded Arnold a fifth star, were pressing him for a firebombing campaign against the Japanese home islands. 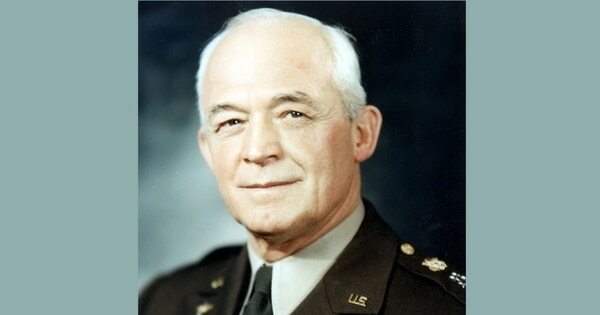 When 20th Air Force field commander Haywood S. Hansell Jr. balked at dropping incendiaries, which he saw as immoral, a furious Arnold replaced him with Gen. Curtis LeMay, who was itching to burn Japan. Less than two weeks later Arnold’s worst heart attack yet laid him low. 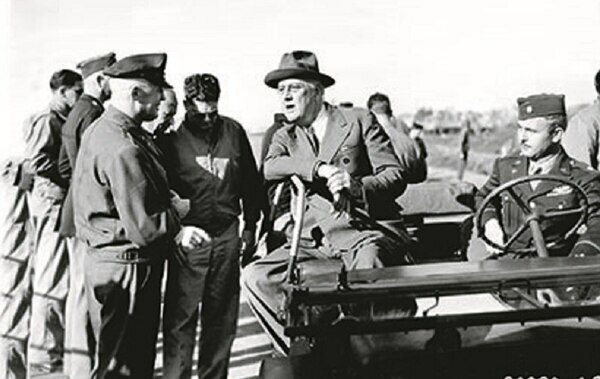 He turned the 20th Air Force over to LeMay and spent the war’s final months making inspection tours in both theaters. This article was originally published in World War II Magazine, a sister publication, on Oct. 13, 2016.